The Harris County Flood Control District has begun work on the Lauder Stormwater Basin, a project that will help reduce flood risks in portions of the Greens Bayou watershed of north North Harris. HARRIS COUNTY – The Harris County Flood Control District has begun excavation of the Lauder Stormwater Detention Basin, a project that will help reduce flood risks in the Greens Bayou watershed of north Harris County. On May 1, 2018, Harris County Commissioners Court awarded a $3,730,268 construction contract to low bidder Challenger Services Inc. for an intermediate phase of excavation at the 90acre Lauder site near Lauder Road and Aldine Westfield Roads. Construction began in June 2018 and will take about six months. The project will involve the excavation of approximately 343,280 cubic yards of soil. It is one of several planned and ongoing projects included in the Flood Control District’s umbrella effort known as Progress Greens. Formally identified as HCFCD Unit P500-06-00, the Lauder basin has been partially excavated in previous excavation and removal agreements. Future phases of the project will involve excavation of additional land as it is acquired by the Flood Control District. Property acquisition and environmental permitting is underway. The final basin design includes a permanent pool, island and other features to improve stormwater quality. The design preserves a 200-foot-wide wooded area along Greens Bayou, a tree buffer along the east side of the site, and a remnant channel or oxbow. When complete after additional construction phases, the basin is expected to hold at least 1,200 acre-feet, or more than 391 million gallons of excess stormwater that otherwise Reducing Flood Risks, might flood homes and businesses. Stormwater detention basins reduce flooding risks during heavy rain events by safely storing excess stormwater and slowly releasing it back to the bayou when the threat of flooding has passed. 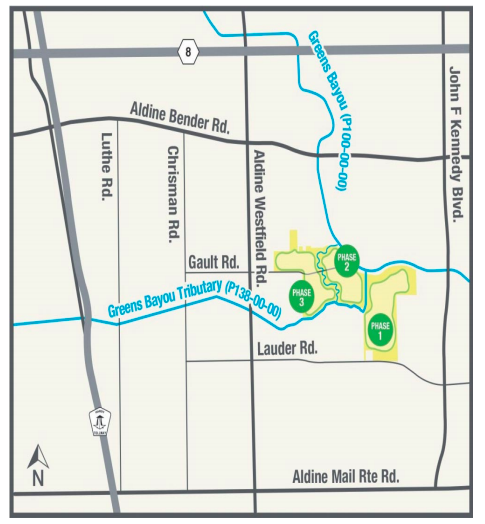 The Lauder basin project is part of the Greens Bayou Mid-Reach Flood Damage Reduction Plan, which includes construction of four stormwater detention basins, improvements to 11 miles of channel between John F. Kennedy Boulevard and Beltway 8, and modifications to 19 bridges. The Kuykendahl and Glen Forest basins are currently under construction; the Aldine Westfield basin is in design. The contractor will use large construction equipment to remove trees, vegetation and soil from the site. 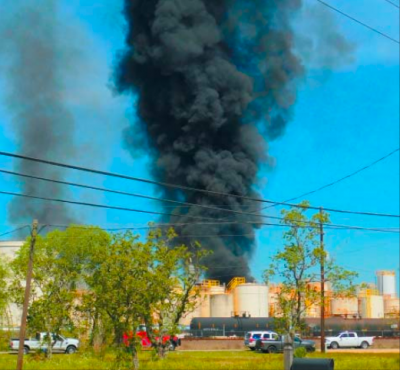 Residents and motorists are being urged to observe posted warning signs and obey safety personnel, especially during hours of heaviest construction traffic. The Flood Control District appreciates the public’s patience and understanding through the duration of this project. Members of the public with questions or comments about this project may call the Flood Control District’s Project and Study Information Line at 713-684-4040, or email ProjectCommunications@hcfcd.org.